2 Latitude Position north or south of the equator. The sun strikes the Earth at different angles at different latitudes. This determines the climate at each latitude. Climate includes wind, cloud cover, temperature, humidity, and precipitation. 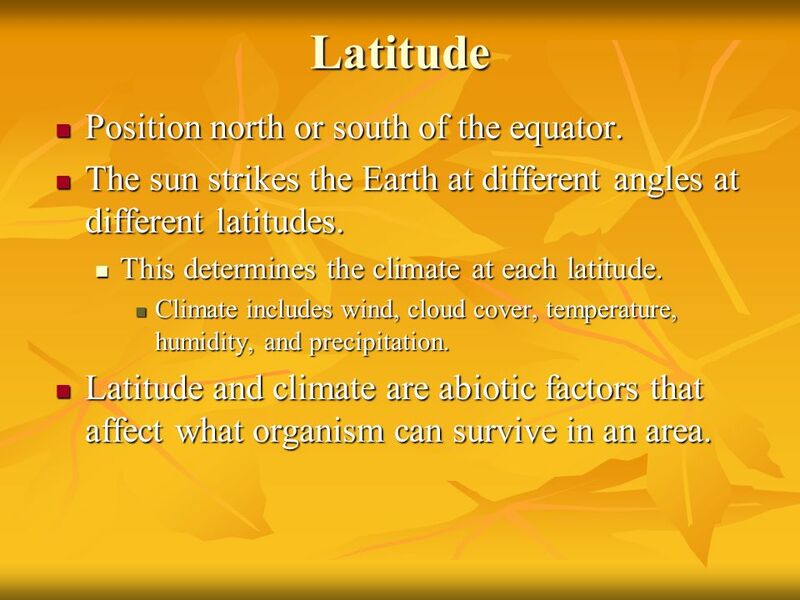 Latitude and climate are abiotic factors that affect what organism can survive in an area. 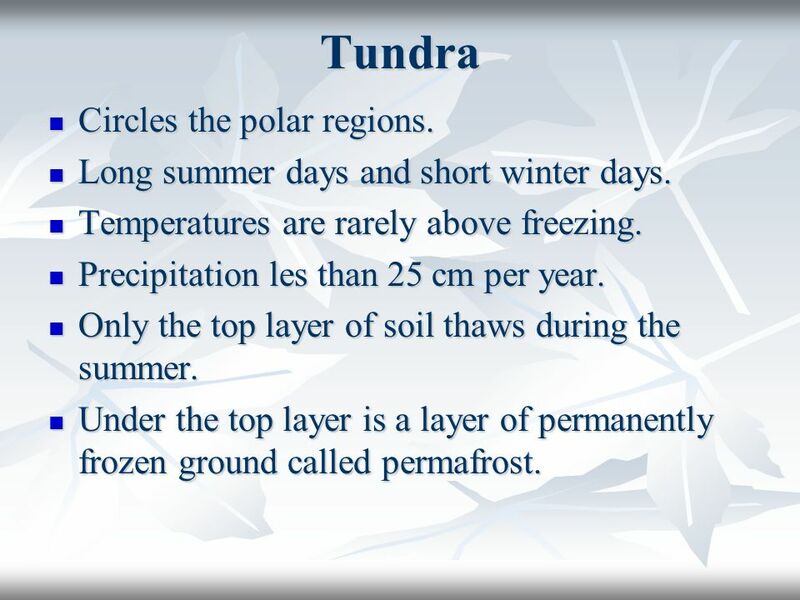 3 Tundra Circles the polar regions. Long summer days and short winter days. Temperatures are rarely above freezing. Precipitation les than 25 cm per year. Only the top layer of soil thaws during the summer. Under the top layer is a layer of permanently frozen ground called permafrost. 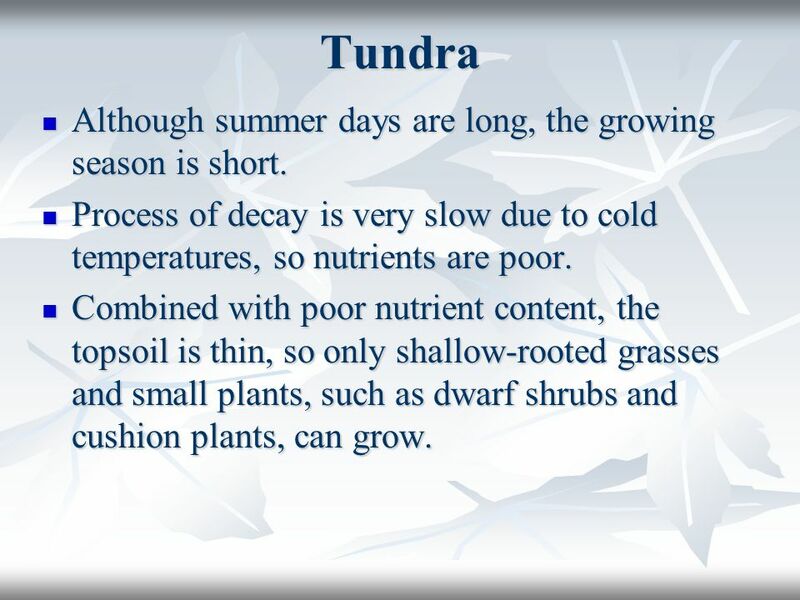 4 Tundra Although summer days are long, the growing season is short. Process of decay is very slow due to cold temperatures, so nutrients are poor. Combined with poor nutrient content, the topsoil is thin, so only shallow-rooted grasses and small plants, such as dwarf shrubs and cushion plants, can grow. 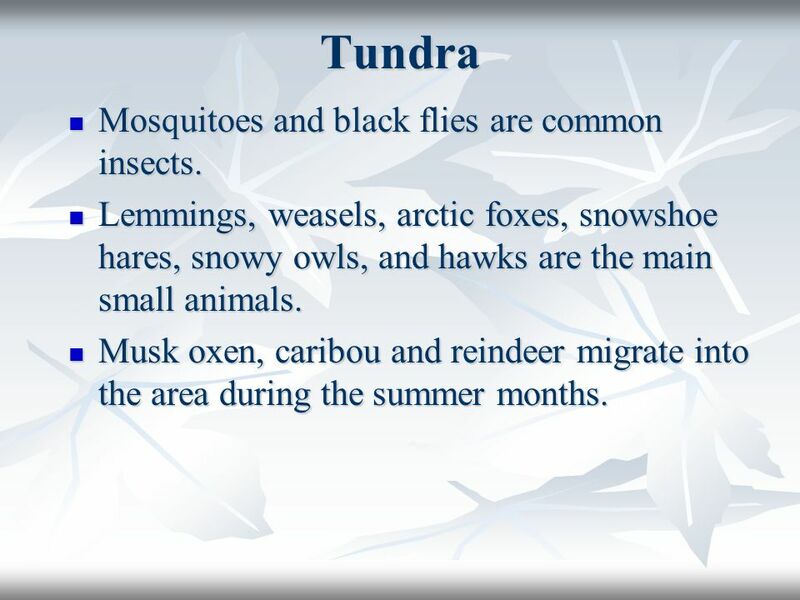 5 Tundra Mosquitoes and black flies are common insects. Lemmings, weasels, arctic foxes, snowshoe hares, snowy owls, and hawks are the main small animals. Musk oxen, caribou and reindeer migrate into the area during the summer months. 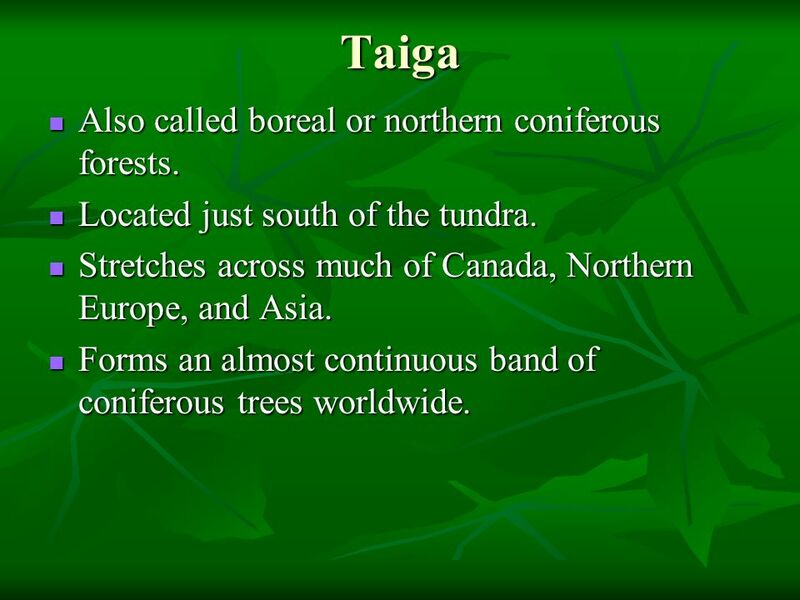 6 Taiga Also called boreal or northern coniferous forests. Located just south of the tundra. Stretches across much of Canada, Northern Europe, and Asia. Forms an almost continuous band of coniferous trees worldwide. 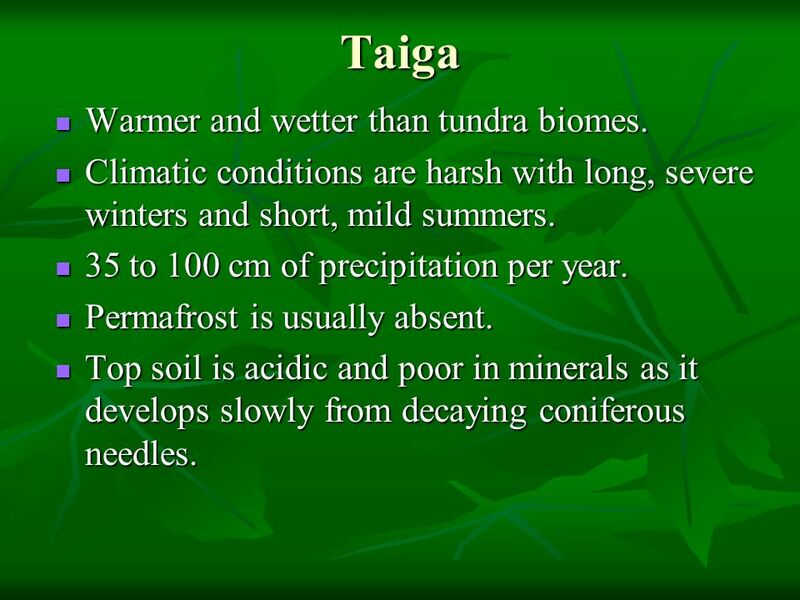 7 Taiga Warmer and wetter than tundra biomes. Climatic conditions are harsh with long, severe winters and short, mild summers. 35 to 100 cm of precipitation per year. Permafrost is usually absent. Top soil is acidic and poor in minerals as it develops slowly from decaying coniferous needles. 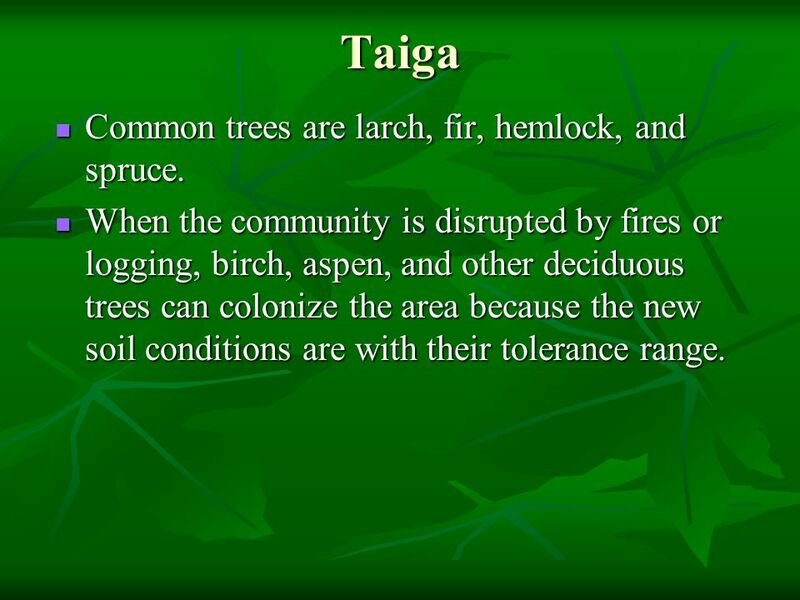 8 Taiga Common trees are larch, fir, hemlock, and spruce. When the community is disrupted by fires or logging, birch, aspen, and other deciduous trees can colonize the area because the new soil conditions are with their tolerance range. 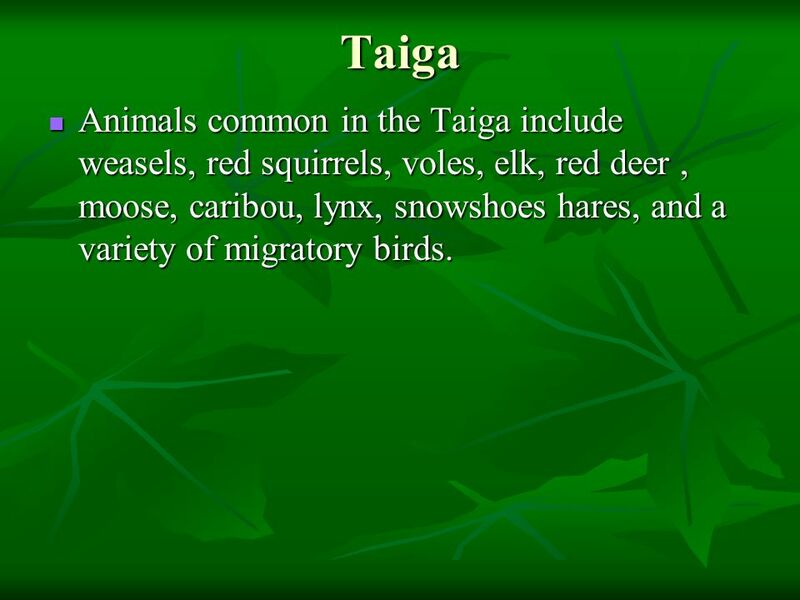 9 Taiga Animals common in the Taiga include weasels, red squirrels, voles, elk, red deer , moose, caribou, lynx, snowshoes hares, and a variety of migratory birds. 10 Desert Arid region with sparse to almost nonexistent plant life. 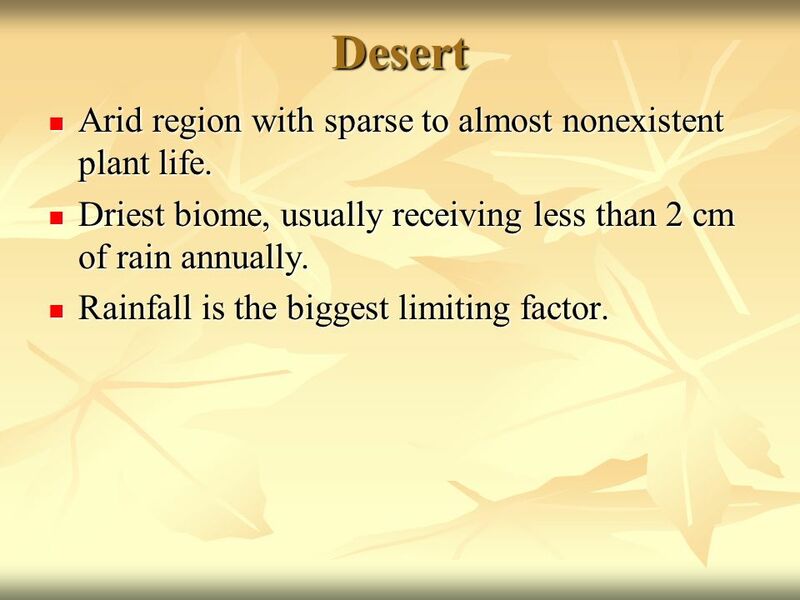 Driest biome, usually receiving less than 2 cm of rain annually. Rainfall is the biggest limiting factor. 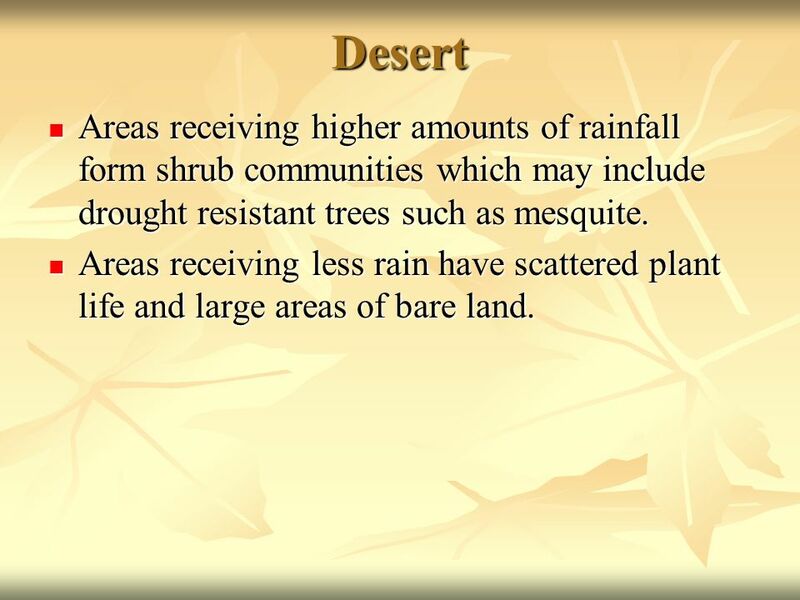 11 Desert Areas receiving higher amounts of rainfall form shrub communities which may include drought resistant trees such as mesquite. Areas receiving less rain have scattered plant life and large areas of bare land. 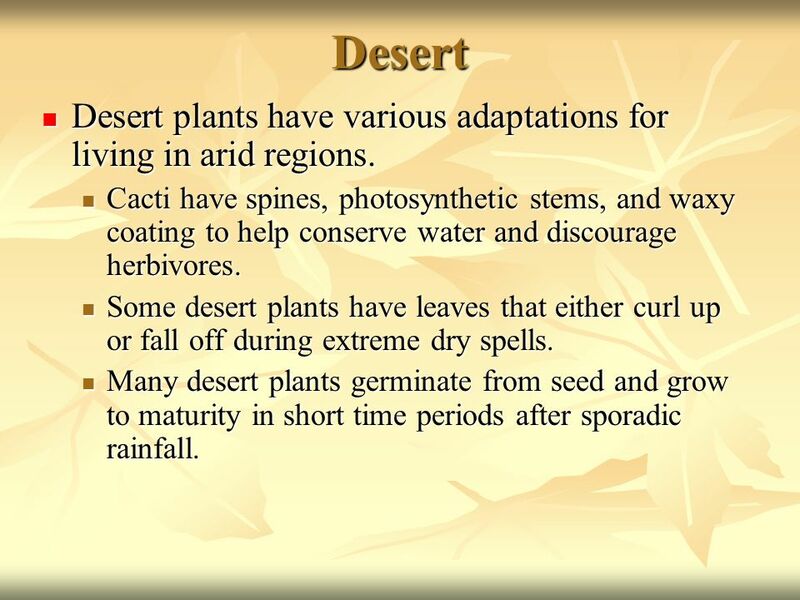 12 Desert Desert plants have various adaptations for living in arid regions. Cacti have spines, photosynthetic stems, and waxy coating to help conserve water and discourage herbivores. Some desert plants have leaves that either curl up or fall off during extreme dry spells. Many desert plants germinate from seed and grow to maturity in short time periods after sporadic rainfall. 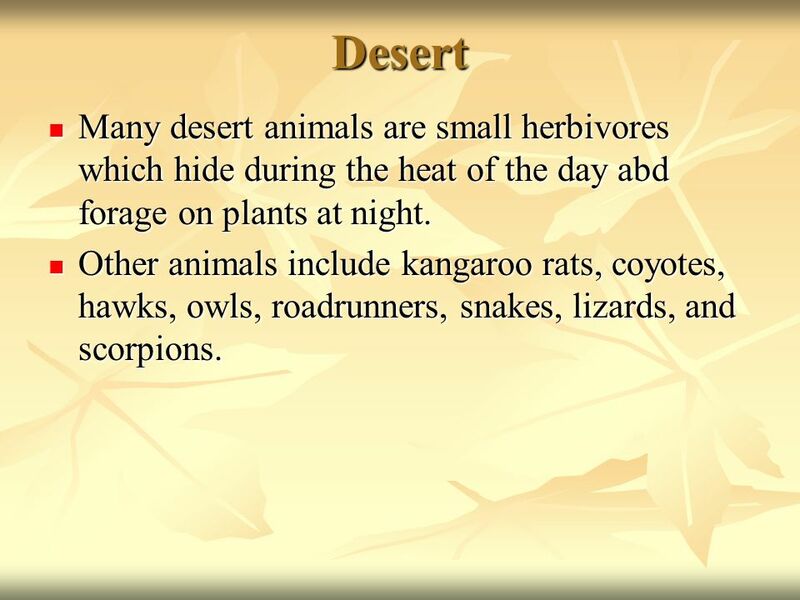 13 Desert Many desert animals are small herbivores which hide during the heat of the day abd forage on plants at night. Other animals include kangaroo rats, coyotes, hawks, owls, roadrunners, snakes, lizards, and scorpions. 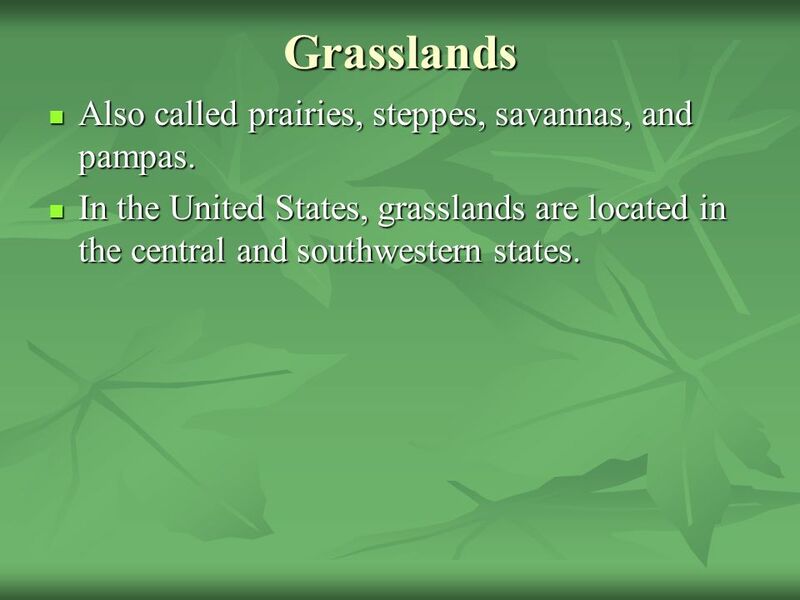 14 Grasslands Also called prairies, steppes, savannas, and pampas. In the United States, grasslands are located in the central and southwestern states. 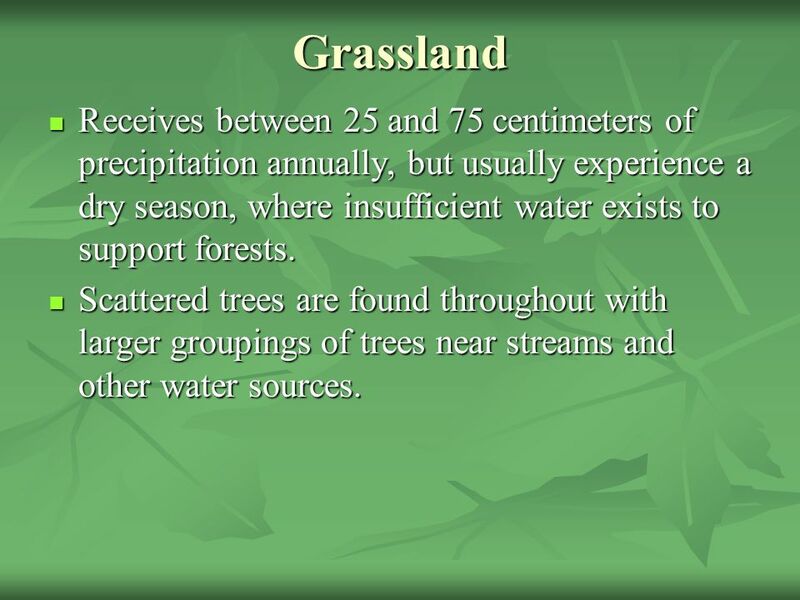 15 Grassland Receives between 25 and 75 centimeters of precipitation annually, but usually experience a dry season, where insufficient water exists to support forests. Scattered trees are found throughout with larger groupings of trees near streams and other water sources. 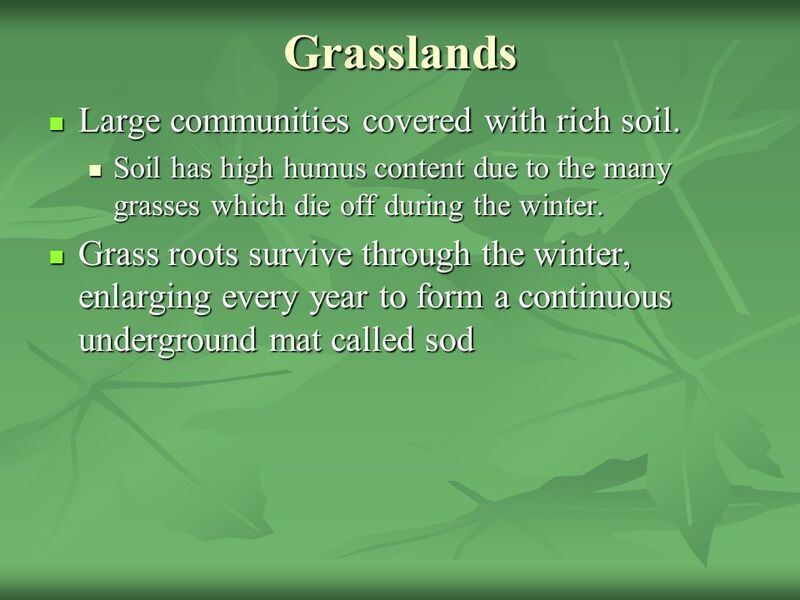 16 Grasslands Large communities covered with rich soil. 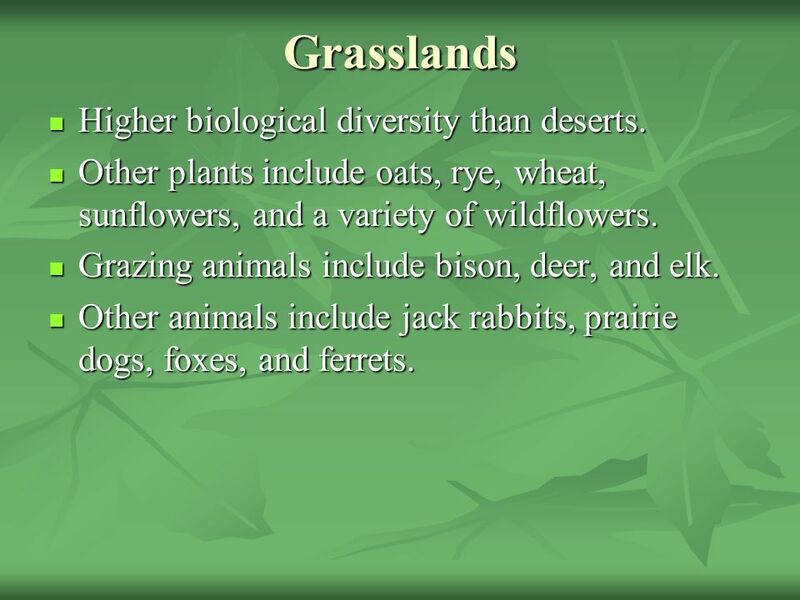 17 Grasslands Higher biological diversity than deserts. Other plants include oats, rye, wheat, sunflowers, and a variety of wildflowers. Grazing animals include bison, deer, and elk. Other animals include jack rabbits, prairie dogs, foxes, and ferrets. 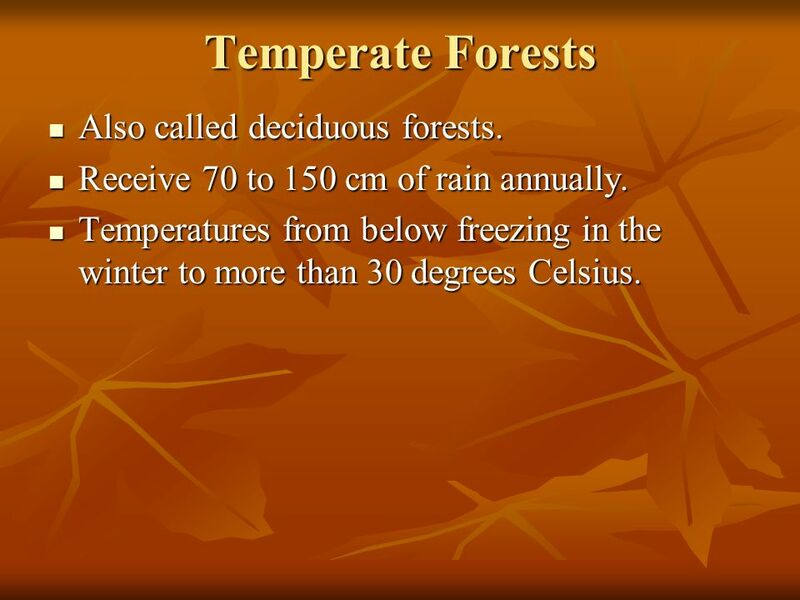 18 Temperate Forests Also called deciduous forests. Receive 70 to 150 cm of rain annually. Temperatures from below freezing in the winter to more than 30 degrees Celsius. 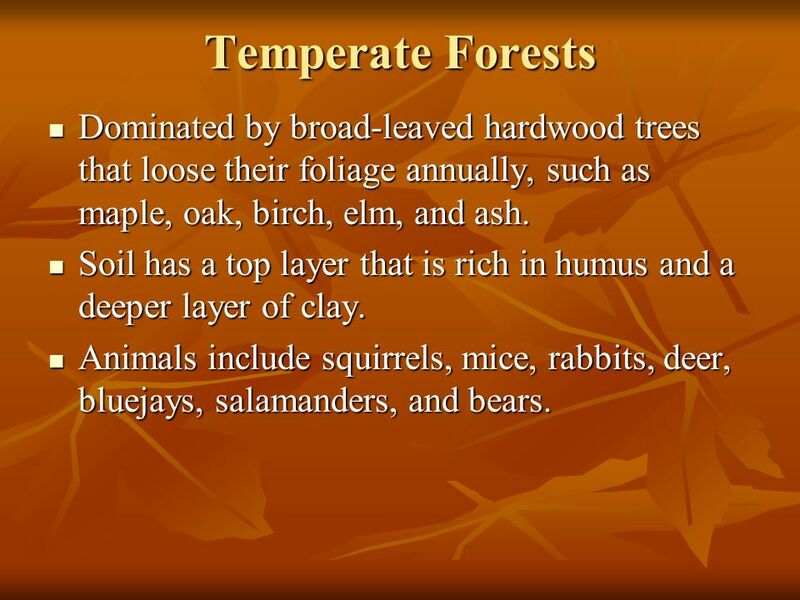 19 Temperate Forests Dominated by broad-leaved hardwood trees that loose their foliage annually, such as maple, oak, birch, elm, and ash. Soil has a top layer that is rich in humus and a deeper layer of clay. Animals include squirrels, mice, rabbits, deer, bluejays, salamanders, and bears. 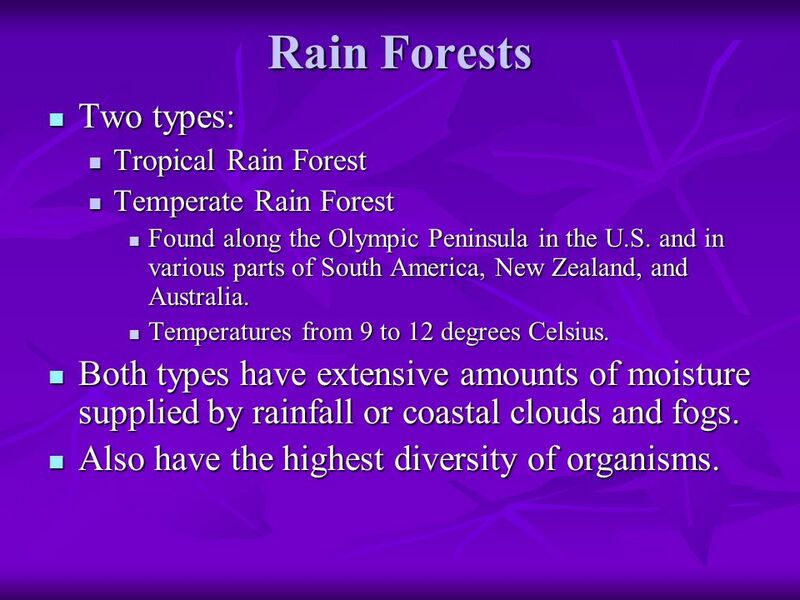 Tropical Rain Forest Temperate Rain Forest Found along the Olympic Peninsula in the U.S. and in various parts of South America, New Zealand, and Australia. Temperatures from 9 to 12 degrees Celsius. Both types have extensive amounts of moisture supplied by rainfall or coastal clouds and fogs. Also have the highest diversity of organisms. Because they are located near the equator, tropical rain forests were not covered by ice during the last ice age and thus have had more time to evolve. Tropical rain forests have year-round growing conditions which create a greater food supply which in turn can support a greater number of organisms. 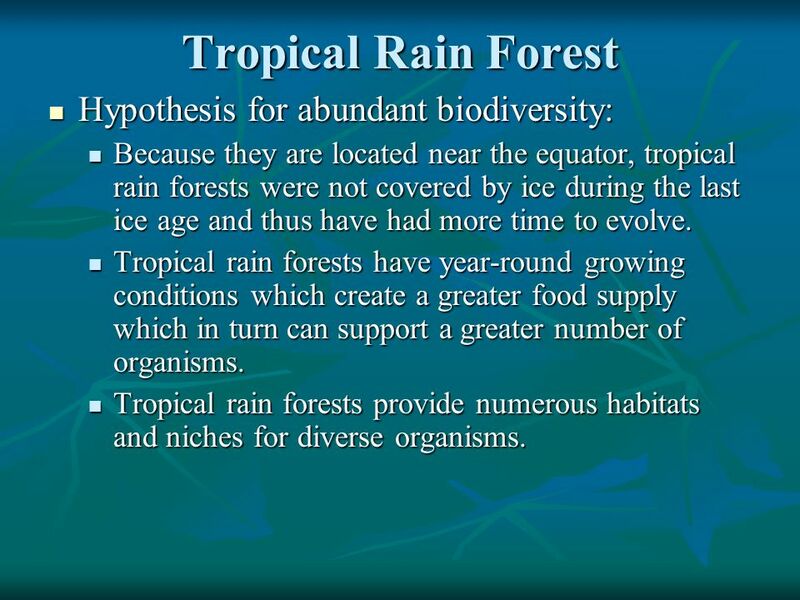 Tropical rain forests provide numerous habitats and niches for diverse organisms. 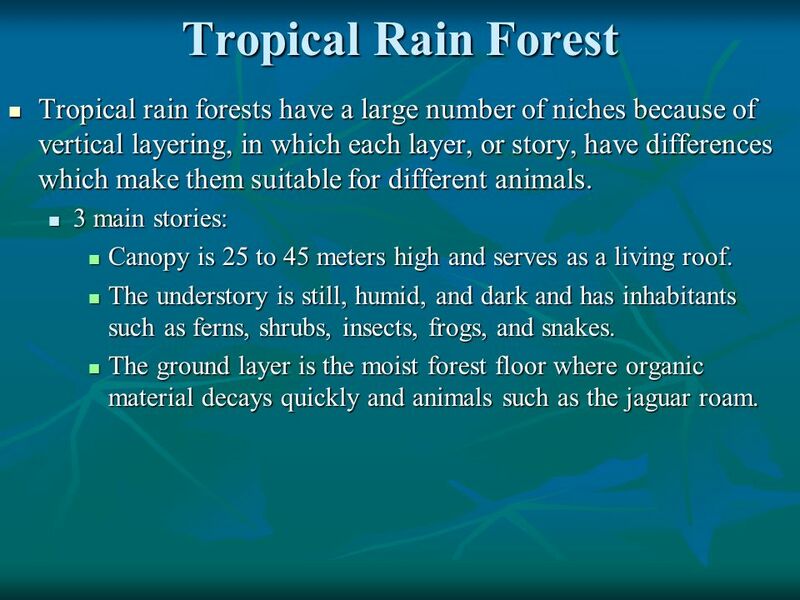 23 Tropical Rain Forest Tropical rain forests have a large number of niches because of vertical layering, in which each layer, or story, have differences which make them suitable for different animals. 3 main stories: Canopy is 25 to 45 meters high and serves as a living roof. The understory is still, humid, and dark and has inhabitants such as ferns, shrubs, insects, frogs, and snakes. The ground layer is the moist forest floor where organic material decays quickly and animals such as the jaguar roam. 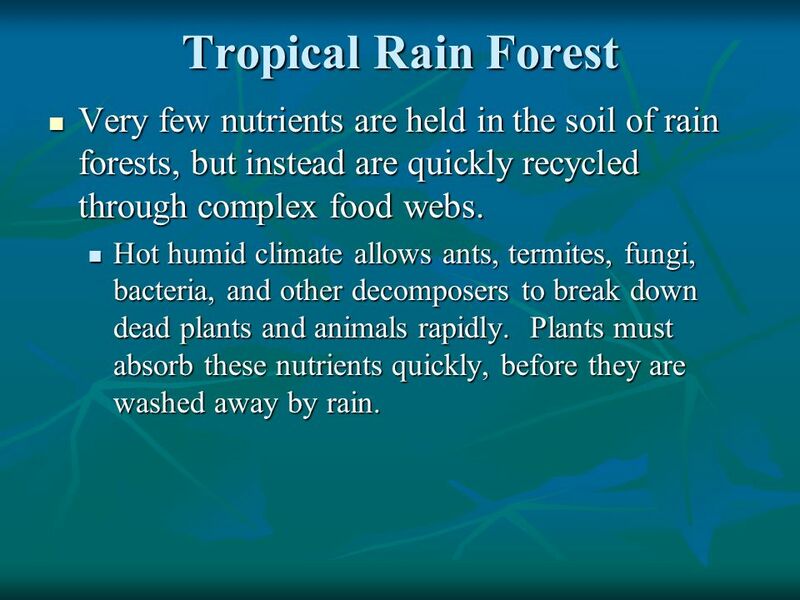 24 Tropical Rain Forest Very few nutrients are held in the soil of rain forests, but instead are quickly recycled through complex food webs. Hot humid climate allows ants, termites, fungi, bacteria, and other decomposers to break down dead plants and animals rapidly. Plants must absorb these nutrients quickly, before they are washed away by rain. 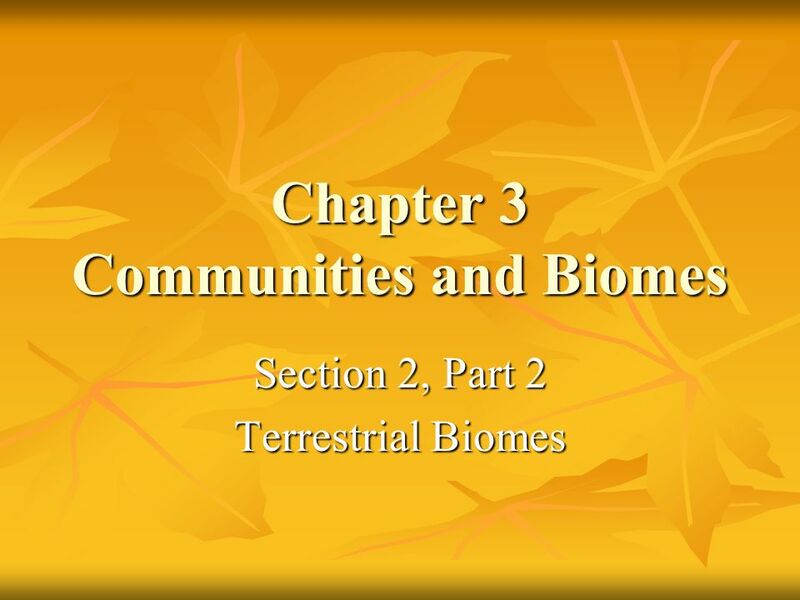 Download ppt "Chapter 3 Communities and Biomes"
BIOMES Created by Nancy Robbins, Sunnyside. Biomes Chapter 6 & 7. 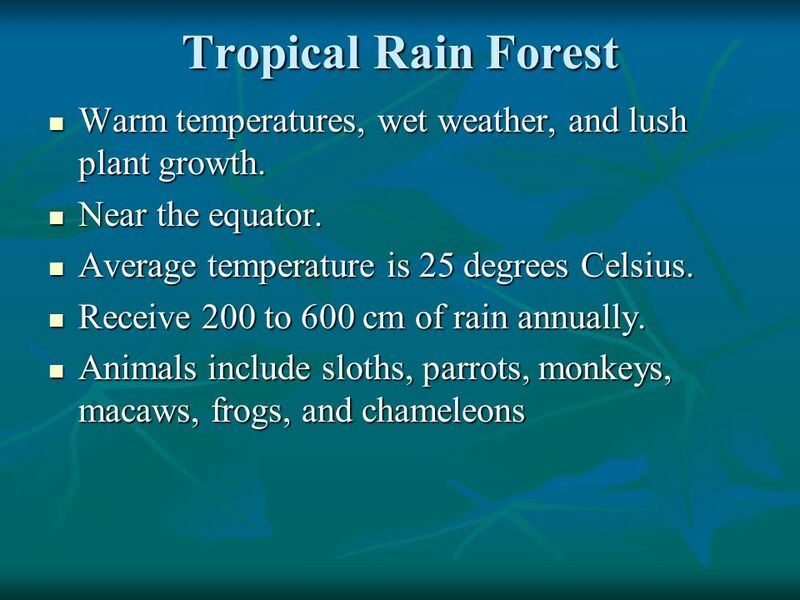 Tropical Rain Forest Located Near the Equator High Precipitation No Seasons Temperate Rain Forest Middle Latitudes High Temperature Moderate Temperatures. Communities and Biomes. Communities ► In communities there are various combinations of abiotic and biotic factors that result in conditions that are suitable. What are biomes? Biomes are regions of the world with similar climate, animals, and plants. Biomes: An Overview Question:What is a biome? Answer:Large group of ecosystems that share the same type of climax community Climax community= stable, mature.